Teaching English online – that is, conversational or business English – as a second language has always been a great opportunity for English speakers without formal teaching experience. Your native understanding of idioms and natural turns of phrase are exactly what many international students need to improve their English use. In our increasingly global world, the need for English tutors is growing – which is great news for you. The work-at-home opportunities in this industry have been booming the past few years. There's never been a better time to get involved! Most companies want you to have a desktop or laptop with a webcam, a noise-cancelling USB headset, and high-speed internet. These are pretty standard requests among all work-at-home jobs and no additional software is needed with these positions. Most of these tutoring positions require video contact with your students, so you should have a good computer, high-speed Internet connection, webcam, and a quiet, well-lit home office. These can all be purchased inexpensively on Amazon or at your local dollar store. You may even have what you need in your child’s toy chest. If finances are tight, head out to your local Goodwill or a neighborhood garage sale. These items should not be hard to come by and you should be able to pick up everything you need to get started for just a few bucks if purchasing second-hand. Many of these companies have their own curricula and teaching systems in place, so you don’t even need to plan your own lessons. These positions can also be great if you’re up at odd hours, since working with overseas students may mean working very early or rather late – especially since many of these students come from China, South Korea, and Japan. I’ve put together a list of great companies who are looking for ESL tutors; there’s sure to be an opportunity for you below! Note: Pay rates, requirements and work arrangements can change at any time. Please refer to the company website for current details. 1. 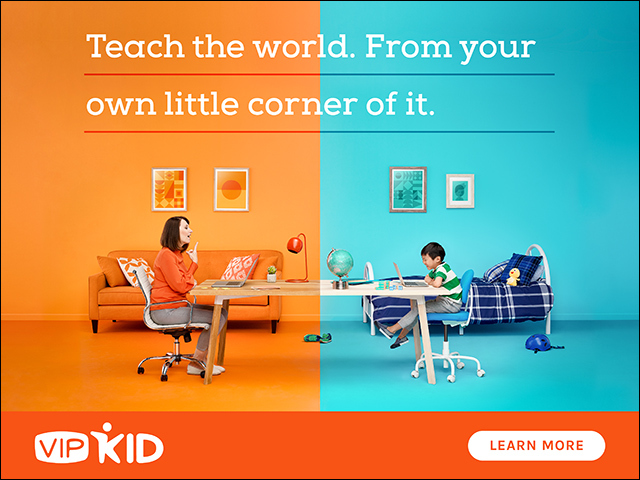 VIPKID is looking for those who want to have fun teaching English to kids. All lesson plans and course materials are provided. Applicant needs to be a resident of the US or Canada. You also need a Bachelor's degree and reliable computer and internet. Pay is $14 to $22 per hour. 2. EducationFirst is headquartered in the USA and was founded in 1965. Deliver 25-minute high-quality and engaging one-on-one online classes to kids ages 6 to 10. Opportunities to teach are available 24 hours per day, 363 days per year. At the time of writing this post, EF is seeking candidates who can commit to early weekday mornings (4-8:30 am EST) and/or weekend nights/mornings (Friday night 8pm EST to Saturday morning 8am EST and Saturday night 8pm EST to Sunday morning 8am EST). Offers start at $12 per hours base rate plus incentives. A bachelor's degree in any field is required. Ideal candidates are those who either already hold a TEFL certificate or will commit to getting one. 4. Cambly is looking for tutors to chat with students and help them learn English in an informal setting. Their students come from all around the world, and these sessions can be as informative for you as for your students – just think of all the little bits of culture and language you can learn along the way! They pay $0.17 per minute, which works out to $10.20 per hour taught. They pay through Paypal and you can set your own hours. 5. MagicEars requires a bachelor's degree. At the time of publishing this post, the website gives an earnings estimate of $22 to $26 per hour. You must be based in the U.S. or Canada, be a native English speaker and have a great internet connection. 6. Continuum Education Services is a recruitment agency pairing English teachers and tutors with companies who need their services. CES says that all the companies they might place you with offer base pay and flexible schedules. You’re required to be a native English speaker, have TESOL/TEFL certification (or be willing to get certified in 90 days), and certain computer equipment including a headset and webcam. 7. Mango Languages is based in Farmington Hills, MI. They are looking for English coaches with a teaching certificate, degree or some teaching experience. You must commit to 10-20 hours per week and 10-20 hours paid training. 8. eBerlitz has offices in 70 countries worldwide. Pay is reportedly around $14 per hour. 9. Englishunt has offices in Seoul, Korea and Michigan, USA. The company is currently hiring more tutors for their virtual tutoring service directed at the Japanese market. They require their tutors to have ESL certification or teaching certification (in any subject). Their tutors only work part-time, on average about 8 to 12 hours each week. Since you’re tutoring Japanese students, the hours are between 4 AM and 7 AM EST (which are evening hours for your students). They pay $14.50 an hour and provide their own curriculum. 10. Global Mate New York targets South Koreans ages 19 to 50. Open to American tutors. 11. goFLUENT has offices across the globe and contracts business ESL teachers who can commit to 4 hours per day each weekday. 12. Golden Voice English has been popping on the job boards quite frequently lately. They offer tutors for Chinese students in grades 1 through 9. Both group and 1:1 classes are offered. They pay $20 CAD per hour. 13. Lingoda is located in Germany and emphasizes that their lessons are like a traditional classroom course, just online – they hold their lessons through Skype (or their virtual classrooms). You choose how much you work, and their availability is wide open as they offer lessons 24 hours a day, every day. They say the salaries they offer vary based on experience, and salaries reportedly average between $10 to $11 hourly. 14. Pearson pays tutors $14 for 1:1 and $17 for group classes. Business English is their specialty. 15. Rosetta Stone is a well-known name in the language learning industry. They prefer tutors near their main learning hubs. 16. Rype was designed with busy students in mind. This is a US-based company. Pay is unclear though students are offered a 14-day free trial. 17. Twosigmas is located in the UK and looking for ESL tutors to teach 1-on-1 English lessons to children from all across China between the ages of 5 and 12. Reportedly, they’re looking for teachers with experience teaching English, experience teaching children, and a university degree in a relevant field (like Education or Linguistics). It looks like they’ll pay up to $20 an hour depending on your experience. 18. Duolingo offers not just ESL tutoring but with a side of consulting. They are looking for the best of the best in language teachers and assessors. 19. iTutorGroup is open to tutors in the U.S., Canada and the UK. A bachelor's degree is required. You must also have TESOL, TEFL, or equivalent; 1+ years teaching experiences; able to commit to 10 peak hours/week. 20. Voxy is a company located within the U.S. Their learners include students and business professionals across five continents. You need a degree in education, linguistics or TESOL and at least 3 years experience teaching English. A degree or TESL certificate is required. The job description up at the time of writing this post says a commitment of 15 hours per week during peak hours is required. 21. Qkids is one of the few English tutoring gigs that doesn't require a degree. You simply have to be working to attain one as an enrolled university student. (Don't worry. If you already have a degree, they want you too.) This opportunity is open to those in the U.S. and Canada. You must be able to commit to 6 hours per week. Paid training and all coursework is provided. 22. Ginseng English offers ESL tutoring for both general and business students. Masters degree preferred. If you’d like to increase your value and hireability as an English tutor, you can work on getting ESL certified. There are various types and pathways to certification, and sites like ESLteacherEDU.org offer resources to guide you. Are their online ESL jobs with daytime hours? While online ESL jobs can work out great for those on the East Coast looking to work those fringe hours before going to their day job or kids waking up, they can be a little too early for those in Pacific time zone. As you can see, those weekday hours would be 3:40 – 6:10 am for those on the West Coast. Okay for some. Not so much for many. But, you do have some options. Cambly is one site that tutors students from around the world. SayABC, at the time of writing this post, had availability in the weekday evenings (6-9pm EST) and time slots on Saturday and Sunday. Rosetta Stone hires part-time tutors to work 10-12 hours per week during the hours of 6-11am EST weekdays and weekends. goFLUENT has clients worldwide allowing for a more flexible schedule to those here in the U.S.
Lingoda has classes available 24/7. You must have at least 2 years of teaching experience. Continuum Education Services offers instruction to students in Russia, Latin America, and Africa in addition to Asia. This opens up some additional time zones. Yes and no. In general, the requirements for being an ESL (English as a Second Language) tutor revolve around being a native English speaker who is personable, interesting and has great presentation skills. You don’t need a teaching degree in most cases. Most sites are looking for a bachelor’s degree in any subject. Many of these same sites will accept latter year college students who don’t yet have that degree but are working towards it. There will be a few that may require you to have ESL certification or a teaching certificate in a related field. While these companies may not require a degree, the pay rate reflects that. In most cases, you will be paid only around $10 per hour. And even though they may not require a degree, a TESOL/TEFL may still be necessary for those working with children in China. This certificate can be obtained easily and affordably online. Some tutoring companies are even offering assistance in this area. No. The vast majority of these positions do not require you to speak any languages other than English. You need to speak it natively. Does “Teaching Experience” Need to be Formal Classroom Teaching? In most cases, no. Many sites are willing to accept tutoring, mentoring or even coaching in lieu of formal classroom teaching experience. Make sure you include these things in your application. Do I Have to Create the Teaching Material? In most cases, no. Most sites will have the teaching materials already prepared for you and ready to go. What is Pay Really Like? Most sites provide you with a range of pay. Ex. $16 to $22 per hour. The lower number is often the base rate for a full hour worked – some sites offer 30, 40 or 45-minute class blocks – the higher number is with bonuses and incentives tied to working a specific number of hours each week or month. Many sites also offer bonuses around holidays or for picking up dropped shifts on short notice. What’s the Application and Interview Process Typically Like? Most sites will have you submit an online application that includes your credentials (i.e. your education and experience). A few, such as Qkids, will ask that you also submit a short 2-minute video at that time of yourself telling a story or reading a children’s book. This is just to show your command of the English language and personality. These sites look for animated, enthusiastic individuals who can really make learning fun and connect with these students. Once selected, you will usually need to do a video interview with a recruiter. This is standard procedure among most work-at-home jobs today. These interviews typically involve a few questions and may ask you to do a little mock teaching. Practice! And have fun! With some companies, how well you do in your mock session may determine your pay rate. Take it seriously. Once hired, you will have some training time and mock classroom time before you can start picking up shifts. To increase your chance of success with online tutoring be sure you are using a high-speed internet connection and that your computer is working well. Make any required and recommended system updates prior to your interview. A stable internet connection is vital to your success when working online. Companies look to hire tutors who speak clearly and enthusiastically. Gesturing and using facial expressions to help convey your message is strongly encouraged. Practice in front of a mirror if necessary. As you get comfortable with video tutoring and your students, this will start to come naturally. Is it Safe to Work with Foreign Companies? There is a large concern with privacy these days especially when it comes to working with companies abroad. Every country has their own privacy standards, some much stricter than others. We've heard about this a lot recently with the EU and the sharing of data. And this is something we should think about with any job we apply to or software we download, regardless of the location of the company. I can't vouch for individual companies. I can't tell you what their privacy policies say. As with any opportunity you find online, perform your due diligence. Read the fine print. Always go with your gut and never do anything you aren't comfortable with. If you would like to work only with those here at home, a few companies located in the U.S. include Pearson, goFLUENT, Voxy, Rosetta Stone, and more. It's also common practice for many to have a computer used solely for work so none of your personal shopping or banking information is accessed or saved there. Some work-at-home companies actually require that. Thankfully, you can get a laptop on Dell or Amazon these days for around $200. And both offer financing. Some common requirements in this industry include 4GB RAM, Windows operating system, Intel Core i3 or above. And because you are an independent contractor, this may be an expense you can write off on your taxes. And always make sure you have a great antivirus software installed on your computer like AVG which protects against viruses, spyware, malware, unsafe downloads, webcam hacking and more. This is an absolute must for anyone working from home. Are Online ESL Jobs a Good Option for Remote Workers? I have so many members of my community that have been working these gigs this past year or so as the industry has gained popularity. Most of them love the job, the flexibility and the pay. It’s truly an option for those of you who are teachers at heart even if you don’t have the teaching degree. Working with these students can be fulfilling and satisfying. One complaint we hear quite frequently from the companies doing the hiring, however, is people not taking it seriously or being committed. They go through the application process. Go through the training. Then, never pick up a shift. Or, worse yet, pick up shifts and never show up. That lack of commitment is what puts all of our remote jobs at risk. And it happens in every industry. Not being committed, not appreciating the expense that goes into onboarding and training someone, not showing up to cover the shifts you’ve committed to are all things that drive telecommuting positions back in-house. It’s our shared responsibility to prove employers wrong who think we can’t be trusted or aren’t committed or responsible enough to work remotely. Leave the work-at-home world a little better than you found it for the benefit of everyone. Is Teaching English Online for You? The pay is usually well above minimum wage and because tutors can work from home, transportation costs and child care costs are usually not an issue. The job can be done from anywhere with a good internet connection, making it an ideal occupation for travelers. The tutoring is often quite rewarding as well. Assisting another in learning a useful skill and watching them develop that skill is a very satisfying thing to do. The students are generally enthusiastic and well behaved. While not for everyone, teaching English online can be a lucrative and rewarding occupation and anyone with the necessary skills and education may seriously want to consider it as an option. Originally published in August 2016. Updated February 2019. I think there are many such as myself who are fluent in English, but did not complete a degree. Mine was for financial reasons that I had to leave, but I did study at degree level. Feeling that you are not good enough as those who did complete their degree just does not seem fair. People in this position are just as able to read , write and speak advanced English, even business English as others, I feel these people do not get the highest pay choice, even when non completion of a degree still reads as having no mind to that standard of education , even when they do have. Enrolling to study should have it own merits, there should be 3 classifications , completed, not completed degree, but enrolled at university, no degree education at all. Hi, Cistine. Unfortunately, I don’t make the rules. That’s a topic you would need to take up with the companies hiring for these positions. That being said, I don’t believe Cambly requires a degree.